The largest assemblage of contemporary Alaskan Native Arts and Crafts that I've seen is not at any museum but at the Alaska Native Medical Center, ANMC. If you go there, find the elevator. Take it to the top floor of the center, then look for the stairwell. Walk down and you will find displays in the stairwell as well as on every floor. Lots of wonderful stuff. 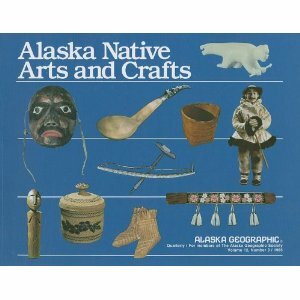 Everything from model sleds to dolls to beadwork to ivory walruses. And there's a gift shop. You should check for hours if you actually intend to buy something. According to a friend, their prices are considerably better than commercial galleries. Not cheap by any means - This isn't 1930 but good values are to be had and the stuff is top quality, no painted rocks or spirit catchers.